MCCOOL JUNCTION, Neb. — August 16, 2016 — Entering the World of Outlaws Craftsman® Sprint Car Series event at Junction Motor Speedway on Tuesday night, Donny Schatz had never finished off the podium in five career starts at the 3/8-mile. The seven-time and defending series champion extended that streak, while adding to his win total at the track, as he dominated the 30-lap main event. Schatz started second and took the lead on the top side of the track from pole sitter Joey Saldana. Schatz would go on to lead all 30 laps aboard the Bad Boy Off-Road J&J for Tony Stewart Racing. The race was slowed by a pair of cautions, both on the second lap. On the first restart, which was a double file restart, Schatz chose the high side of the track and shot out to a lead. Following the second caution, officials elected to go with single file restarts the remainder of the night. On that restart, Schatz again used a strong run to quickly open a gap on David Gravel, who had moved into second, after Joey Saldana suffered a broken rear end while running second. Late in the race, Schatz caught lapped traffic, and with how fast the track was it took several laps to get around a couple of cars. That allowed Gravel to close as the leader was not able to get around those machines. With six laps remaining, Schatz was able to get around the two cars he had been trying to lap and pulled away. For Schatz, the win was his 17th of the season and his third triumph at Junction Motor Speedway. He is the only driver that has won more than once at Junction Motor Speedway. The win also helped him extend his lead in the championship standings as he chases his eighth title. Gravel was able to get side-by-side with Schatz coming off turn-four on lap-23, but was not able to make a pass. Late in the race, Gravel had to fend off several charges by Brad Sweet as the pair battled for the second spot. The runner-up finish for Gravel was his 34th top-five finish of the season. Sweet started third and fell back to fifth early, before making a late-race charge. While the lead duo was negotiating the couple of lapped cars during the last 10 laps, Sweet was able to close in on Gravel, but couldn’t quite get enough of a run to make a pass. The third-place finish for Sweet was his 33rd top-five of the season as he kept pace with Gravel in the point standings. The pair is separated by just three markers. Daryn Pittman finished fourth, after a side-by-side battle with Shane Stewart, who crossed the line fifth. Logan Schuchart finished sixth, with Jason Sides seventh and Jason Johnson eighth. Ian Madsen, who opened the night by setting a new track record in time trials finished ninth. Paul McMahan rounded out the top-10. The World of Outlaws Craftsman Sprint Car Series returns to action on Sunday, August 21 at Angell Park Speedway in Sun Prairie, Wisconsin, along with Bumper to Bumper IRA Sprints. 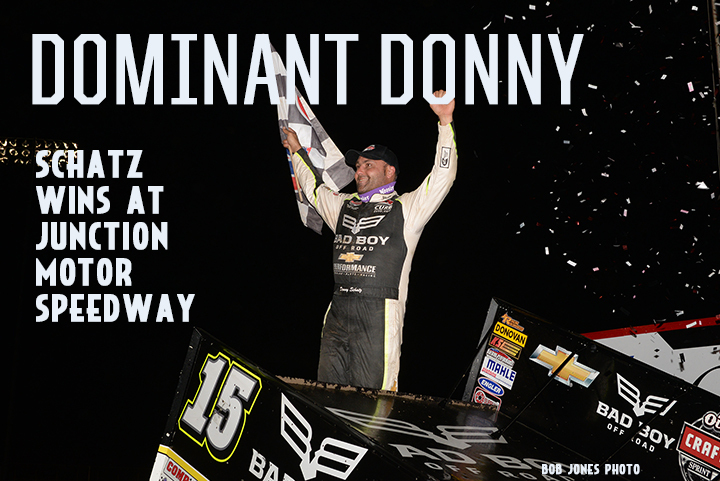 RACE REPORT: With Joey Saldana on the pole, Donny Schatz took the lead during the first lap of the Junction Motor Speedway Feature and carried it all the way through the 30 laps for his seventeeth win of the season. While David Gravel and Brad Sweet pushed on him, threatening to make it a three-way race to the finish, they trailed behind for their respective podium spots. Qualifying - 1. 18-Ian Madsen, 13.518; 2. 9-Daryn Pittman, 13.561; 3. 49-Brad Sweet, 13.563; 4. 1S-Logan Schuchart, 13.619; 5. 5-David Gravel, 13.668; 6. 41-Jason Johnson, 13.693; 7. 15-Donny Schatz, 13.706; 8. 83-Joey Saldana, 13.712; 9. 2-Shane Stewart, 13.725; 10. 1A-Jacob Allen, 13.756; 11. 1M-Danny Lasoski, 13.781; 12. 7S-Jason Sides, 13.830; 13. 1X-Don Droud Jr, 13.924; 14. 7-Paul McMahan, 14.048; 15. W20-Greg Wilson, 14.061; 16. 13-Clyde Knipp, 14.519; 17. 53-Jack Dover, 15.019.